Try not to cook this for too long as the prawns will trun rubbery. 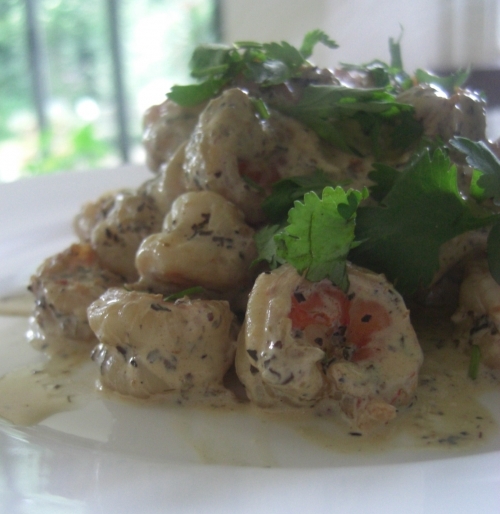 Delicately spiced and flavoursome prawns. Lovely with rice or pasta. Add the chai tea, seasoning and olive to the prawns, stir well and leave to marinade for 30mins. Heat a frying pan and cook the prawns over a high heat until they look nearly opaque, add the garlic and creme fraiche, turn the heat down and simmer for a few mins, add more seasoning if required and serve. Serve with the parlsey sprinkled over.